Cambodia can be a mentally difficult place to vacation in if you pay attention to its history. It is a country that experienced a genocide, which left nearly a third of its population dead, and displaced all city residents to rural areas for forced labor. But it is also a country that is filled with beautiful ancient temples and inexpensive food, transport and accommodations. There are attractive elements that draw tourists, but it has a disturbing underbelly that is hard to come to terms with. After nearly a year of travel and visiting more than 25 countries in that time, Cambodia gave us the longest roller-coaster of emotional highs and lows. 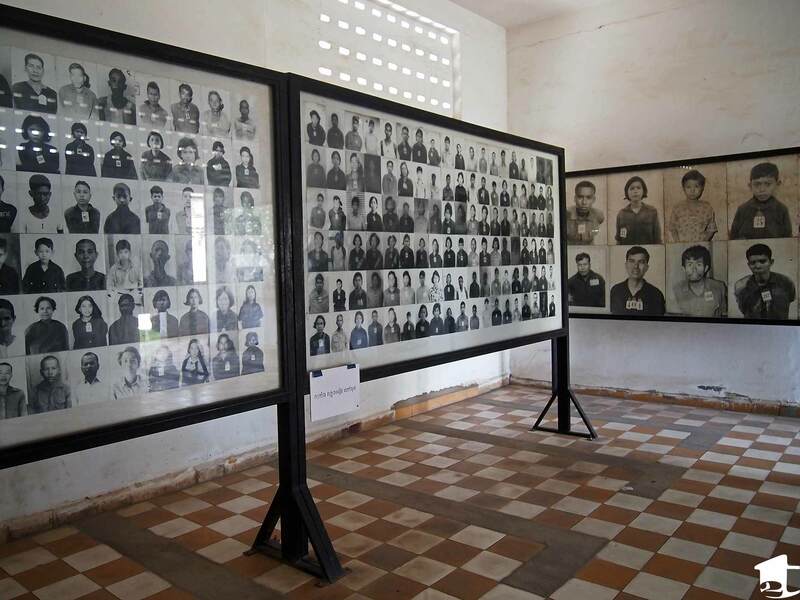 Admittance photos taken by the Khmer Rouge of some of their victims inside S-21. This is an article I struggled with writing for more than a month. After several attempts to write an historical and experiential piece, I found it neither satisfied me as a wholly accurate history nor a great recount of what we did. Cambodia’s history between 1975-1979 is simply too horrific. Even after the atrocities that were committed during this period by the Khmer Rouge, the country still has elected officials who were members of the former regime and, worse yet, it was only within the past few years that these crimes against humanity have been addressed in the form of a tribunal. If you are not aware of the horrors of the Khmer Rouge, I recommend you go to primary sources, like biographies of those who survived this era to read more about the regime. To give a short synopsis: The Khmer Rouge came to power after a civil war – welcomed by the people – only to turn around and slaughter one in three citizens. It was a Communist party that tried to turn the country into a self-sufficient, agrarian nation. It is a sad and sickening story, but one that is somehow not well known throughout the world. Instead, when most people think of Cambodia, they picture Siem Reap’s Angkor Wat. And yes, we had three absolutely amazing days touring the ruins and spent our nights on Pub Street enjoying inexpensive food, drinks and massages. In many ways, it was the calm before the storm. When we arrived in Phnom Penh, we knew we were gong to visit the genocide museum and the killing fields, but we knew little about the history of either. In hindsight, it would have been better to have more knowledge of the country’s history beforehand. The Tuol Sleng Genocide Museum (Security Prison 21, otherwise known as S-21) and Choeung Ek (The Killing Fields) are two former Khmer Rouge locations we visited. S-21 is now a museum (admission $2). In 1975, it was a high school that the regime converted into a torture/interrogation secret prison. The prison’s four three-story tall buildings do not have a lot of museum-style information in them. They have been left pretty much as they were found, down to the blood-stained floors. While a couple of the buildings have some descriptions and explanations in English, we would recommend hiring a guide to take you around ($6 for 45 minutes). We found it was essential to understanding the prison and the country’s history during the Khmer Rouge. There is also an hour-long documentary that runs a few times a day in one of the buildings that is worth watching if you have the time. Overall, we spent several hours in S-21; it is a meditative place that will take time to walk through. The Killing Tree at Choeung Ek, draped in friendship bracelets given by visitors. Likewise, Choeung Ek, better known as The Killing Fields, is not an easy site to visit. While S-21 was a torture prison, Choeung Ek is a mass graveyard. If you are staying in Phnom Penh, it is a 30-minute tuk tuk ride ($12) outside the city center. Admission ($5) includes an indispensible audio guide that takes you from the site where the regime dropped off their victims to the mass graves where they were murdered to the horrific killing tree where children were murdered. Between walking around the area listening to each story on the audio guide, wandering through the small museum and watching a 15-minute video, we spent about two hours at Choeung Ek. It was possibly the most horrific site we visited on our entire trip. If you are going to visit Cambodia, it is important to understand its history, and advisable you do so before you arrive. Otherwise, it is difficult to visit these sites without becoming overwhelmed, especially if you are trying to see them during the course of a couple days. I would recommend visiting S-21 first and then Choeung Ek. These may be difficult places to spend time in, but they are important ones nevertheless. Do not make the mistake of skipping them if you find yourself in Cambodia. This entry was posted in Destinations and tagged Cambodia, Choeung Ek, genocide, Khmer Rouge, S-21, Security Prison 21, The Killing Fields, travel, Tuol Sleng Genocide Museum. Bookmark the permalink. No problem. I must admit it is probably pretty surreal to people who vacation in Cambodia. Since we are traveling longer than most, I felt we had a better ability to come to terms with the contradictions of this country. I know about the Cambodian history, I watched few documentaries and films about those horrendous years. I wish we made it there. I know how though can be seeing these places, I’ve been at two concentration camps in Germany and Poland where Jews were murdered and it wasn’t easy. Thanks. The article and the video were a struggle to write/edit. Seeing atrocities (like Nazi concentration camps) firsthand is so difficult to comprehend, but is vital to understanding the scope of such horrors; reading/seeing a documentary is just not enough. I hope you two get a chance to make it to Cambodia. Amazing post and a beautifully done video. I visited the Choeung Ek Killing Fields on my very first day in Asia. It was an intense introduction to Southeast Asia but of course I’m glad that I went. It’s hard to believe that things like this have happened so recently. It’s so important to learn about the history. I think in high school there was maybe a line or two about the Khmer Rouge in my AP World history class. But the realities of the genocide didn’t really hit me until I saw the mass grave sites and walked past bone and fabric fragments that the rain had unearthed. Thanks Karisa! Your post, “Beers cans, bone fragments and AK47s” was quite the introduction to this region. 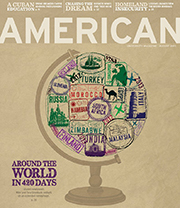 I agree that world history classes in U.S. gloss over Cambodia’s history. It is important to be aware of this especially, like you said, how recently it occurred.